The Cat Rescuers is an upcoming documentary about four dedicated volunteers who are saving the lives of hundreds of abandoned and feral cats on the streets of Brooklyn. Check out our Kickstarter! 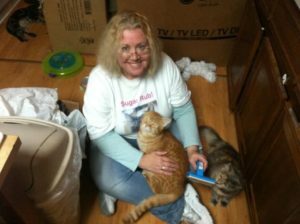 Meet Today’s Rescuer: Deb Hoffman! 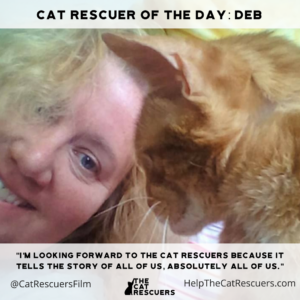 Deb has worked with Staten Island Hope Animal Rescue, Anjellicle Cats and Brooklyn Bridge Animal Welfare Coalition. Fostering (8 years), rescuing (20 years) and TNR as of last year. We have rescued both off the streets, and off death row in NY. Our last ‘pull’ used Staten Island Hope, temp cat fosters, and Imagine Home to get two cats on death row in New York to us in Bay Minette, Alabama. Her name was Miracle and she was just that. Her story, which I wrote after we got her, is below. Sadly, Miri lost her fight with breast cancer. Though she is not with us now in physical form, she is my inspiration for the shy ones, the cats who have no where else to go, and the cats who truly do come in from the cold. When we lost our Natalie (“the Natcat”) suddenly in January of 2014, it hurt. Natalie had started what I referred to as the ‘continuation’ of her life with us from out of a bottom cage of a ‘rescue‘ that for the most part ignored her. When we got Natalie, we took into our lives an elderwise grumpy sage with a temper. (Think Pat Morita from the Karate Kid in cat form, with an attitude). Natalie survived breast cancer, went through surgery and chemo with us, and then battled her tail and Feline Hypoestatia Syndrome for all of her time with us. She was endearing, testy, ever quick with a feline smile or smacky paw as the mood took her. Her passing, from a probable stroke, left a void in our lives. It wasn’t as if we didn’t have other cats. We did – plenty of them. Ruffy, Smokie Boo (Natalie’s arch enemy), Princess, CK, Calvin, Midnight, Paws and Ringo. We had a full house, for sure. But there was this big empty place, because Natalie was larger than life. I “work” the PODR pages as a volunteer, and had followed them for over a year. Hard to look at, my heart dropped with every cat lost, leapt up in joy when one was saved. We had pulled Paws and Ringo from Death Row, with the intention of finding them homes. They, however, had other ideas. Paws was rude when people came to meet him. (I think his being dumped at ACC at age 8 had made him realize he wanted no other changes, and we didn’t push it.) Ringo quickly bonded so well to our other cats that she simply became part of the Clowder. Two potential foster homes fell through when Ringo decided to hide, dodge loving hands, and cringe in the corner of a carrier when people came to meet her, only to come slinking out when they left with a look of abject relief on her face. No, they were here to stay. But that March, I knew somehow that our cat family would grow again. Our cat, Orange Ruffy, now the most “elderwise” of the Ridgewood Clowder, wrote once ‘Trust that Miracles Do Occur.” Ruffy is a Familiar, a Cat who has sat at my shoulder and gazed at the screen, and I knew he was seeing beyond what I did. So, it was no small matter when one March day when scanning the new ‘urgent’ cats one caught my eye. Her face was on e of abject fear, total terror and defense. They had her labeled as “fractious,” but also stated she had been fearful, but allowed touch. Her name was what did it. It was a sucker punch to my soul: MIRACLE! I called my husband at work and sent him her picture. She was in danger. She was from the Bronx. She was, according to the ACC report, missing patches of fur, and was labeled “feral” and “fractious.” I looked at her picture and I knew, somehow, she was neither. We called the rescue we worked with, with whom we fostered and asked if they would pull her for us. They told us they would and immediately set out to issue a “hold,” which in Miracle’s case would save her life. There were many inconsistencies. She was listed as six years old. When the rescue called, ACC stated she was closer to eight, would that be all right? I said yes. Then, she couldn’t be spayed right away. She had a cold. Would that be all right? As it meant saving her life, I said that would be fine. Then, was I sure, as Miracle was not a “nice” cat. Again, I said yes. I had a feeling about Miracle. In a place like ACC, “not nice” can mean frightened, grieving for a previous owner, or simply upset at being in a place they don’t know or understand. Give that cat a little time, space, and a chance to realize things are going to be ok, and they do come to understand that, and everything changes. The next day it was arranged that Miracle would be delivered that afternoon by the Mayor’s Alliance Wheels of Hope. I got her crate ready and the other cats were curious. They always are, when a new cat comes. I got the call from the volunteer from the Mayors Alliance that afternoon. They were here! I went and got Miracle in her CACC box and brought her up to the apartment. There was a frightened “Mrow?” loud, but pleading. As I set the carrier down in the crate, she glanced up once, huge green eyes, and then huddled as far back into the carrier as she could. I left the carrier in the cage, the top open for her to get out and quietly covered the cage with a sheet so she could have some down time. We had made an appointment with our vet for her. We had no idea what we were dealing with, and though she was technically a foster, I knew this was my heart and soul in that crate. Our vet was to see her the next morning. I was very worried when I saw she was in the exact spot from the night before. If she had moved, there was no sign of it. She had eaten the baby food and fancy feast mix I had put quietly into the carrier for her. At that time, she had bunched herself up into the corner when I stroked her. I was worried. When the vet took her out of the box, she stared at everyone with huge green eyes, and looked absolutely fearful. She was a mess. She had wet herself, too scared to move , apparently. Her tail was raw, exposed to the bone, there were patches of fur gone. She was sneezy. She had arrived with the shelter cold. Our vet put her immediately on two antibiotics, and we wondered if we would be able to get them into her. We were able to medicate her, more easily than could be supposed. She was nearly frozen with fear when we reached in to take her out of her crate. We figured out the best way of medicating her was to put her in her carrier and take it out and give her meds and the 50 ml of fluids. She took it well. Three days later, she was very ill and stopped eating. We went back to the vet, got a change of medication, and we had to syringe feed her. At the time, I was studying for my LMSW exam. I would have her beside me, stroking her fur, and I’d feed her a little at a time. She would fall asleep slowly. For nine days I syringe fed her, and then we turned a corner and she began to eat on her own, slowly, but with gusto. It became evident after a bit that her mouth was bothering her. She was due to be spayed and we scheduled dental work at the same time. The vet told us that he believed she had a very rough life, she was probably abandoned at and possibly abused, it took her a very long time to make eye contact and trust. After her dental and spay, it was as if we had turned another corner. With her mouth feeling better, she could eat more comfortably. She was able to groom, and to really relax, and sleep deeply. Slowly, ever so slowly, her eyes would find us, and once, when stroking her softly she meowed, a peep really, and for the first time, a small rumble. She was purring! I could tell you that she completely came around, but that wouldn’t be true. We have learned that time and patience are the key. Miracle is just that, and has taught us that “feral” and “fractious” are subjective. What you see in ACC photos and read in descriptions simply isn’t true. These are the the defenses of a frightened animal who may have not had great experiences either while being brought to ACC or before. But what can I say about what has happened with Miracle, the cat who truly, as Ruffy would say, has “come in from the cold” for good? Is she the rare exception? No, she’s not. She’s exactly what every “Cinderella” cat is, beneath the growling and swatting and “fractious” behavior. There is a ‘Miracle’ in every frightened and fierce looking face. A cat whose only defense to mask the fear and protect itself , which is in itself all bluff, for kindness, patience, and above all, time, will bring out out the real feline, the cat whose trust will be rebuilt. It only ever takes time. In May, for Maddie’s Day we made it official and formally adopted Miracle. I debated on this for awhile, because Miracle had changed greatly. She was no longer the “fractious” cat from ACC, but my friend, my companion, one of the Ridgewood Clowder. She had become my “Miraboo.” But, it’s selfish in some ways. Miracle is adoptable now, if only by someone who can understand that this gentle girl was always there, always lingering in that part of herself, knowing there was someone for her, perhaps hoping against hope that help would arrive. She loves brushing, and will sit enjoying it. Mornings are her “happy time” when she wakes, waiting for breakfast, which she has on our bed. She hasn’t learned to socialize with the other cats well, perhaps because her time outside meant she had to compete for food for herself and her kittens. Our vet said she might have had several litters. This is behind her now, but change comes slowly in her world. It’s why I am selfish. She would probably do much better in a home where she was the only cat, or one of two. But she’s arrived to stay. As I watch her, sleeping deeply in rest, or laying in the window and watching what goes on outside I am happy, because she’s safe, and well and loved. “Every Night We Tell Their Stories” is the motto of Pets on Death Row. Every night, the barbaric and ever so needless “at risk/to be destroyed” list comes out. Every evening, volunteers quietly sit and write each cat‘s bio. Each cat, a wondrous being, no matter that they be kitten or senior, “feral” and “fractious” or “can go to a beginner home.” Each cat is precious, a life at stake, to be saved or live on perhaps only in the “Gone But Not Forgotten” list to haunt us, to make us both tired of it all, furious, but determined, so determined to change it. I believe, with my whole heart, it can be changed, for after all, there are Miracles in the world. Miracles abound daily. We have the ability within us to change what is. We need only have the courage to do so. To send the email. To say yes to the frightened face, and to work, one cat at a time, with determination, to save them all. I wish they knew how rewarding it can be. When else can you get that feeling knowing you have saved a life? It tells the story of all of us, absolutely all of us. It will bring awareness to all we do, that people don’t understand, that they simply aren’t aware goes on. They must, for we need the support of all animal folks to do this work! All rescues needs support! There are many small rescues who really do need you. We started volunteering with Staten Island Hope because they really are one of just a tiny handful of rescues on Staten Island. We wanted to help, and we loved that they really do not care who you are or where you live. If you want to help, they will help you to help! They are a fantastic organization for one so small! Go follow Deb on Twitter(@FyreKitty). And be sure to follow @CatRescuersFilm on Facebook, Twitter and Instagram, and support our Kickstarter – HelpTheCatRescuers.com!